Currently viewing the category: "Content"
Today I’ve been trying out style and tech for individual picklet promotional videos. This is something that I’d like to do for each picklet published in the Picklets app. The Picklets Launch on Monday went off, enthusiastically attended by about 50 people packed into the 30-seated-capacity theatre at LOOP. This is the 5-panel preview as it will appear in the Picklet Store within the Picklets app on iPad, iPhone and iPod touch. The full picklet consists of 23 panels. 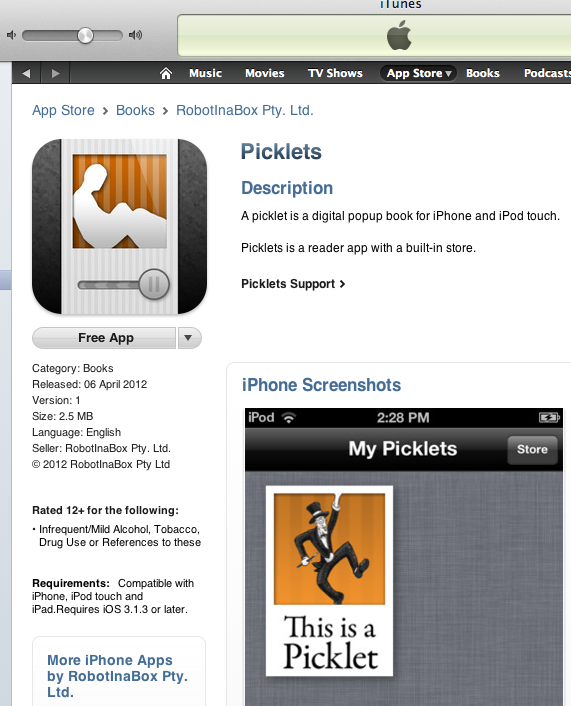 I’m back in Melbourne and starting a final development push to finish the iPad ‘Picklets’ app.